The part one of this article is about present day Bangladesh. And in next part we will discuss reasons behind the Debacle of Dhaka. Geography Area: 147, 570 sq. km. (55,813 sq. mi.). People Nationality: Noun and adjective--Bangladeshi(s). Population (July 2009 CIA est. ): 156 million. Annual population growth rate (July 2009 CIA est. ): 1.29%. 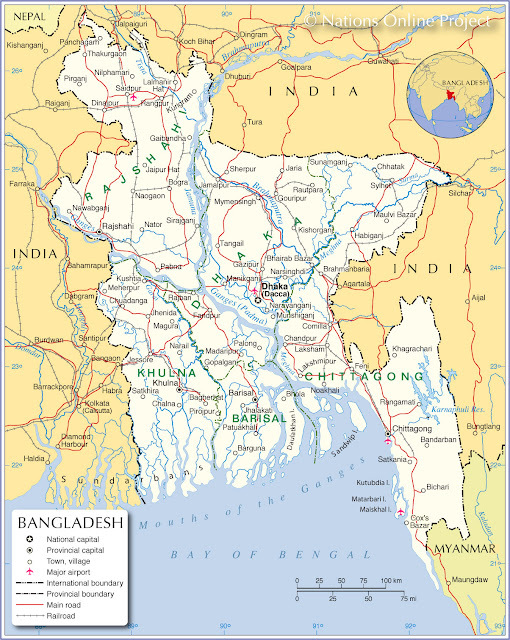 Ethnic groups (1998, CIA): Bengali 98%, other 2% (including tribal groups, non-Bengali Muslims). Religions (1998, CIA): Muslim 83%; Hindu 16%; Christian 0.3%, Buddhist 0.6%, others 0.3%. Health (CIA World Factbook): Infant mortality rate (below 1)--59/1,000. Life expectancy-- 60.25 years. Work force (70.86 million): Agriculture, forestry, and fisheries--63%; manufacturing--11%;mining and quarrying--0.2%. Current GDP (2008 est. ): $84.2 billion (official); $226.4 billion (PPP). Per capita GDP (2008 est. ): $554 (official); $1,500 (PPP). Exchange rate: Dec. 2009: U.S. $1=69.03 BDT; 2008: U.S. $1=68.55 BDT; 2007: U.S. $1=69.89 BDT. Annual budget (2008 est. ): $12.54 billion. Trade: Total imports (FY 2008)--$21.6 billion: capital goods, food grains, petroleum, textiles, chemicals, vegetable oils. Growth rate over previous fiscal year: 25.95%. Total exports (FY 2008)--$14.11 billion: garments and knitwear, frozen fish, jute and jute goods, leather and leather products, tea, urea fertilizer, ceramic tableware. Growth rate over previous fiscal year: 16.04%. Exports to U.S. (Jan.-Dec. 2008)--$3.74 billion. Imports from U.S. (Jan.-Dec. 2008)--$468.1 million. Bangladesh Dhaka debacle east Pakistan .